Voice control is rapidly becoming a popular way of controlling consumer electronics from mobile phones to TVs, whether we like it or not (how often do you actually use Siri?). 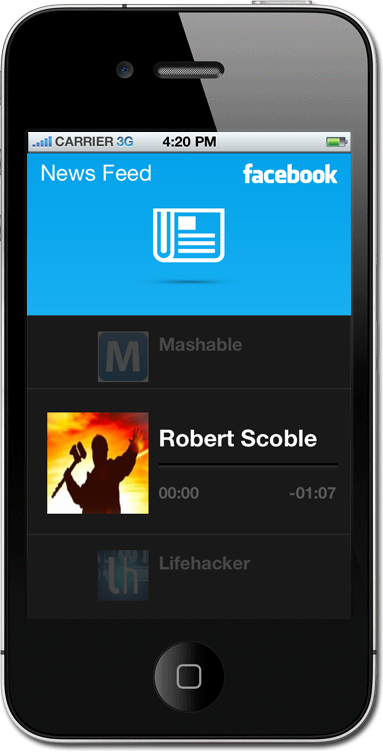 Now a new app is bringing the same approach to Facebook. WonderVoice, which launches today at the Dublin Web Summit (although is currently only available in the US and Canadian App Stores), is essentially aiming to be ‘Siri for Facebook’. 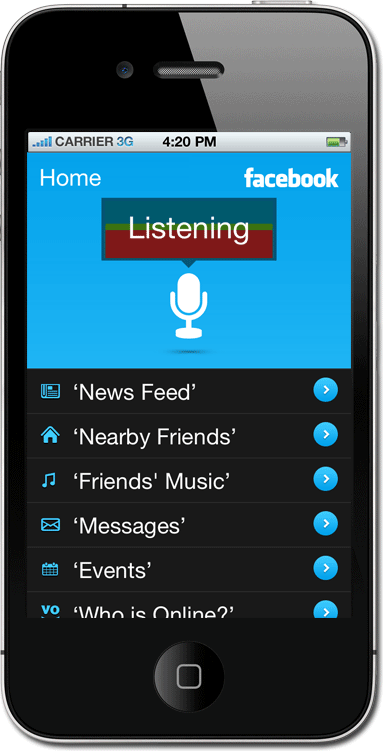 Say “News feed” and it will read out entries from your news feed, say “Nearby friends” and it will tell you who’s checked in close to you recently, say “Friends’ music” and it will play music recently shared by your friends Facebook, for example. The idea of a voice-controlled interface for Facebook is an intriguing one, and WonderVoice certainly points at a way we may be interacting with social networks – and indeed all kinds of online information – in the future. You ask for your latest news feed items and the app reads them out to you, giving you the option to ‘Like’ items simply by saying the word. There’s certainly a feeling of ‘2001: A Space Odyssey’ as you use the app. However, WonderVoice isn’t quite there yet in every way. While you can post a status update or a comment, it isn’t published as text. Instead it’s posted as a link that your friends can click on to listen to an audio clip on you saying the words. The app doesn’t understand natural language either, so you’re stuck with set commands rather than being able to say “What are my friends’s statuses right now?”, or “Who’s available to chat?” That’s fair enough, but when offerings like Siri are far more flexible, you need to be prepared to lower your expectations. Not everything can be controlled via voice, either, there are some situations where only a tap of the ‘Done’ button, or a flick of a finger to the next item in a list will do. It all leads to a feeling that this is an app that’s ‘almost there’. While WonderVoice isn’t quite ready to allow you to use Facebook entirely with your voice yet, it’s an interesting app that’s worthy of a try, and it will no doubt improve over time. Support for other social networks such as LinkedIn and Twitter is planned. The app costs $1.99 and currently supports the iPhone 3GS, 4, 4S and 5.